Does anyone else feel like fall has had a bit of an identity crisis? The beginning of it was super hot, almost unbearable summer temperatures. Then we got some bone-chilling 32 degree days last week, and now it's back in the 40's and 50's. Regardless, autumn is finally here and that definitely means sweater weather. And scarf weather. But for the purposes of this blog, it is most certainly soup weather. 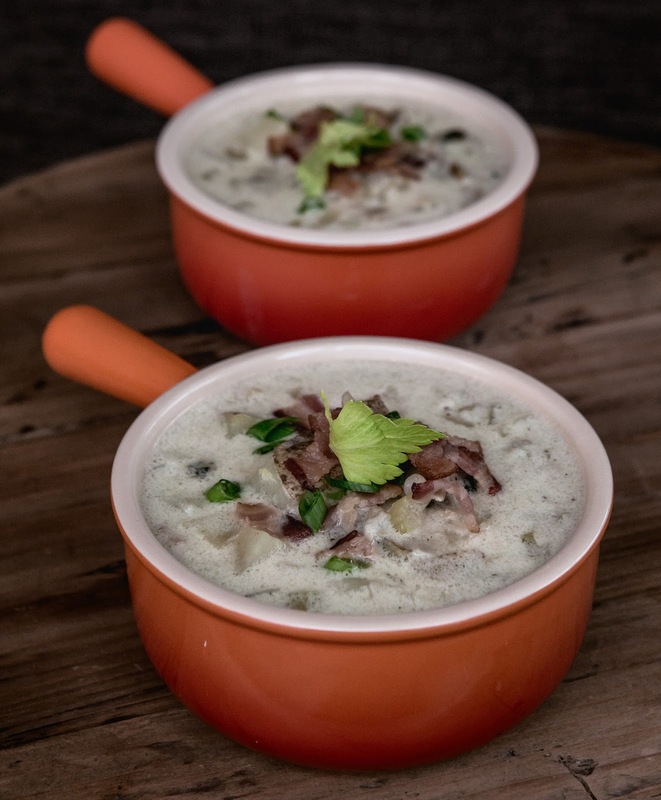 A warm, thick, creamy bowl to warm you up on the coldest of days. 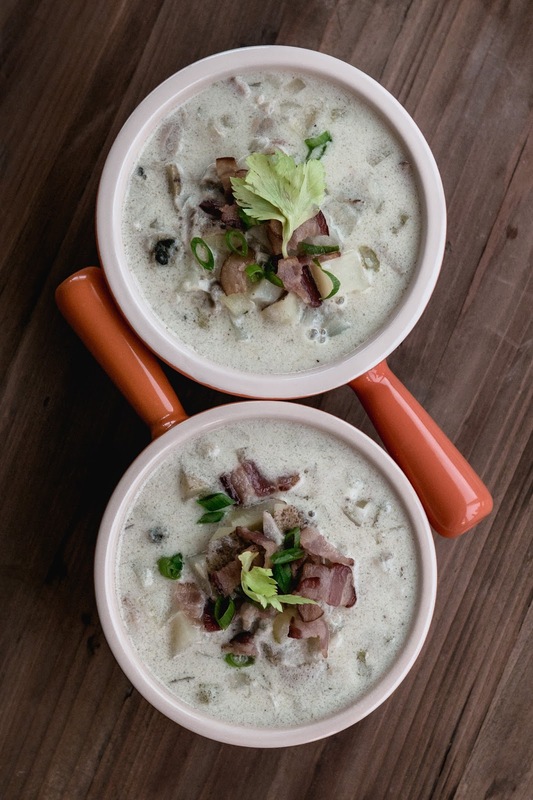 My dad's clam chowder definitely checks off all those boxes. He made it for Justin and me when we were home visiting Montana this past September, and I couldn't wait to share it with you here on the blog. While it's perfect for fall, you can really justify making it anytime of year. Of course, as I do with most recipes, I put my own tweaks on it. My dad uses milk in his, but I subbed it out for half and half to make it just a tad creamier. 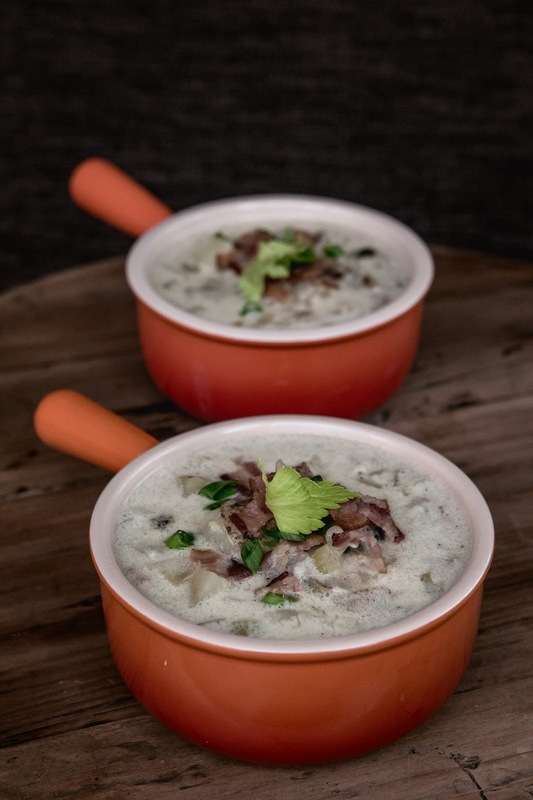 I also added some garlic to mine, and used clam stock instead of water to pump up the clam flavors even more. His recipe also makes quite a large batch, so I more or less cut his in half to make it more of a 6-8 serving recipe. 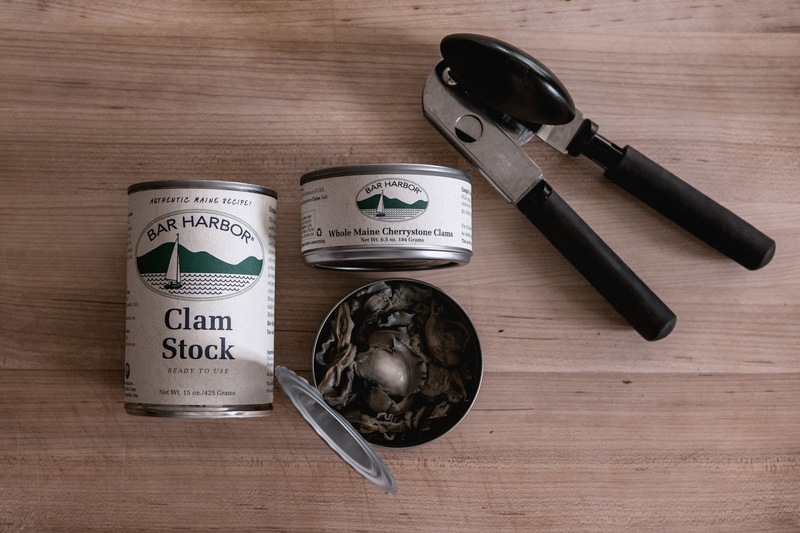 You'll need between 18-20 ounces of clams to make this recipe. (Though you could technically use less and just not have as much clam meat in your chowdahhhhh.) I actually did three 6.5 ounce cans, so that gave me about 19.5 ounces. However, I realize some companies make 9 or 10 ounce cans, so that's why I'm giving a range here so you're not driving yourself crazy whilst staring at cans of clams in the grocery store attempting to do math. You will also need some potatoes. My dad uses Russet potatoes, so that's what I used, but you can really use whatever you prefer (such as red potatoes or yukon gold.) I left the skins on for a little color and texture, but you can peel if you don't like the skins. Tip from my dad, Dennis: As soon as you are done chopping the potatoes, drop them into a bowl of water to keep them from browning. OR, in my case... I dropped them into a bowl with the clam juice and broth. 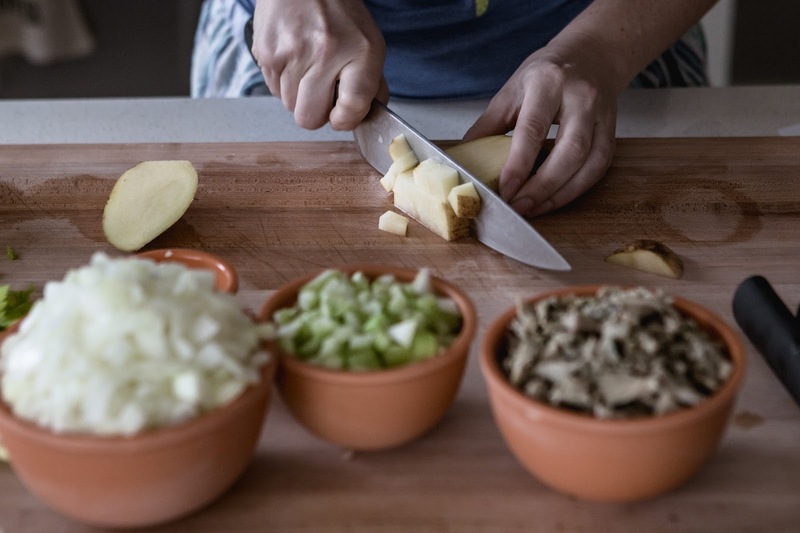 Another tip from Dennis: Chop everything up ahead of time so that the recipe goes faster. I told him that the French call this mise en place. 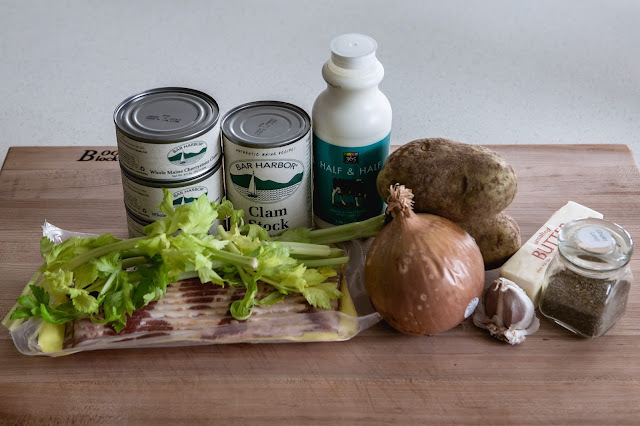 Almost as important as the clams are in this recipe: the bacon. In a Dutch Oven, fry the chopped bacon until just crispy. Drain on paper towels, leaving the bacon grease in the pot. To the bacon grease, add the onion and celery and sauté until soft, about 5 minutes. Then add the garlic, and some celery seed (if using) and sauté a minute longer. Next, you will add some flour to make a roux, which will help thicken the soup. Add 3 tablespoons of all purpose flour (you can sub with rice flour or potato flour to make it gluten free.) Stir and cook for another 2-3 minutes so you cook out the "raw" taste of the flour. Cook another couple minutes, until clams are warmed through. Thanks to my Dad for sharing his recipe and to Justin for the awesome photos (some of which he stood on the counter to get, haha.) I usually do the editing on my own, but I just loved the rustic fall look he added to these! So what are you waiting for? Whip up some of this clam chowder, cozy up with a blanket and enjoy this delicious soup while the temperatures continue to drop outside. 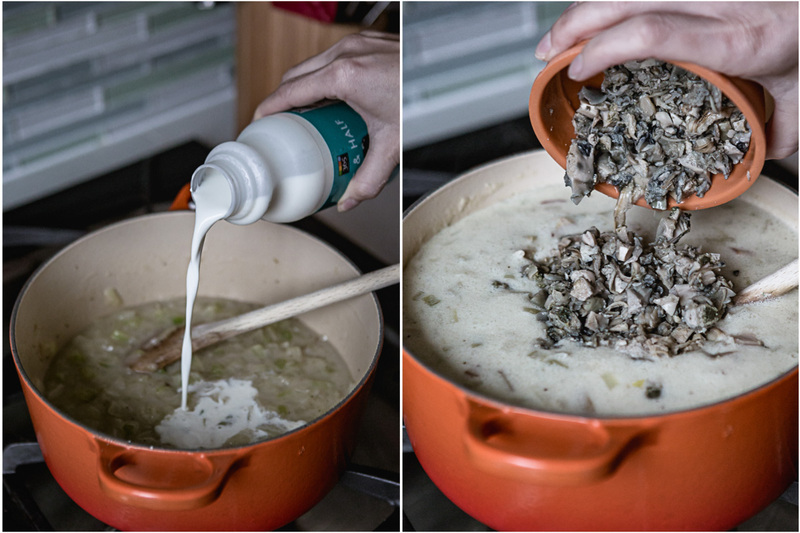 Drain clams, reserving juice into a measuring cup. Roughly chop clams. Set aside. To the clam juice, add enough water to equal 1 cup of liquid. 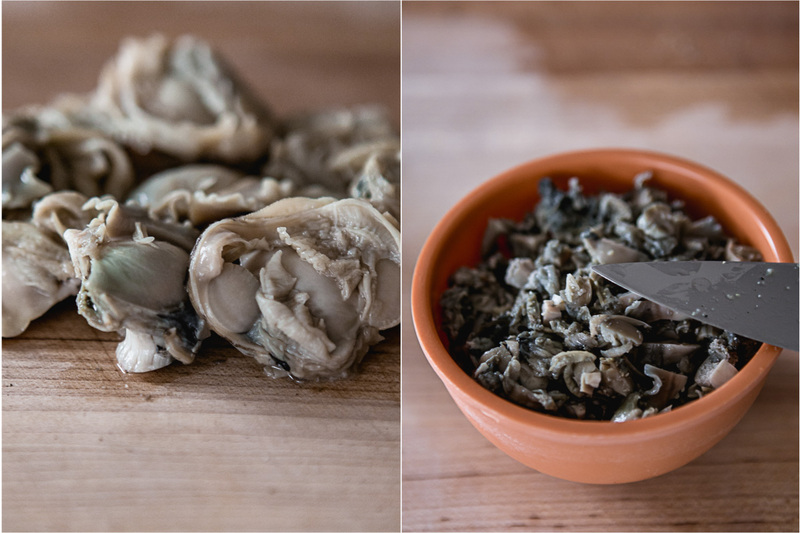 Pour into a large bowl, along with the stock (or to additional clam juice/water, whichever you are using.) Set aside. Scrub potatoes (or peel, if you prefer) and cut into 1/2" cubes. 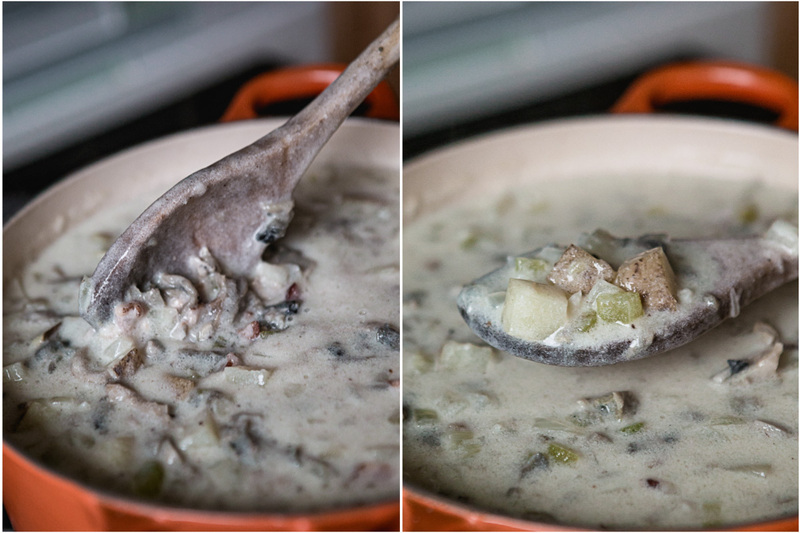 Place into the bowl with the stock & clam juice mixture to keep them from oxidizing. 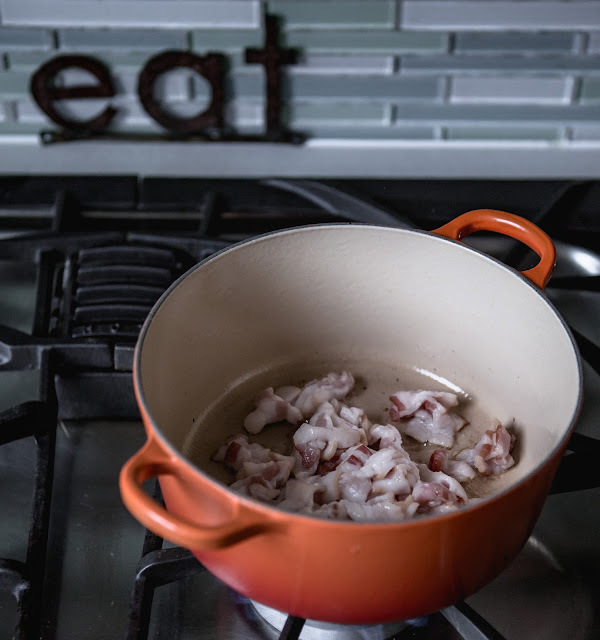 In a large pot or dutch oven, fry bacon lardons until just crispy. Remove to a paper towel lined plate, leaving bacon grease in pot. You should have about 3-4 tablespoons of bacon grease. If you do not, add 1 tablespoon of butter. 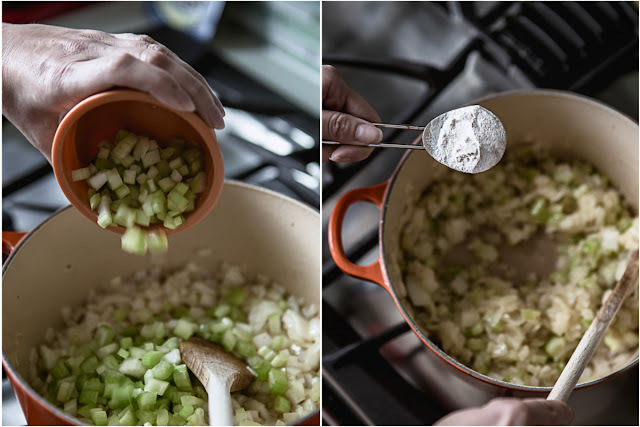 Add onions & celery to the pot and sauté over medium heat until they start to soften, about 5 minutes. Add garlic and celery seed and cook another minute. Add 3 tablespoons of flour. Stir and cook for another 2-3 minutes. Add the potatoes and broth, as well as the half and half. Simmer on the stove until potatoes are fork tender (about 20-30 minutes). Right before serving, add the chopped clams and bacon (reserving a little bacon for garnish, if desired.) Cook another couple minutes, until clams are warmed through. 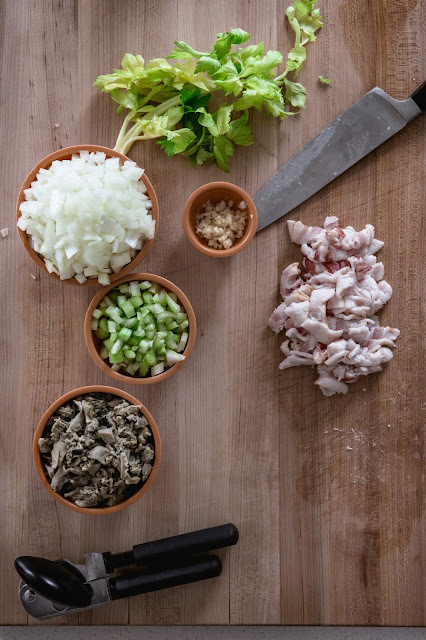 Ladle into bowls and top with some of the reserved bacon, scallions and celery leaves. This looks fantastic! Have you tried freezing it, and reheating it later? I’m on the prowl for good freezer meals.